The rules of the original game apply. When setting up the playing area, the Cutpurse is laid out as additional third market tile next to the Coin Changer and the Head Merchant. When a player draws one or more black counterfeit coins from his or her purse, these coins are not set immediately onto his or her character tile anymore. Instead the black coins are set next to his or her side of the Cutpurse. As soon as one player has set three or more counterfeit coins next to the Cutpurse at the end of their turn, this player received the Cutpurse's services. 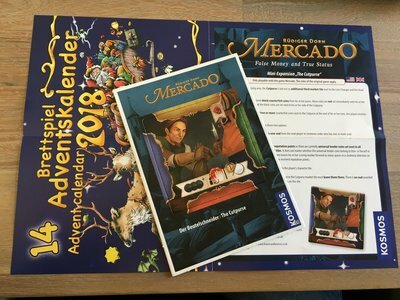 The player receives as many reputation points as there are currently universal tender coinss set next to all merchandise and market tiles. It does not matter whether the universal tender coins belong to themselves or other players. The player then moves their scoring marker forward as many spaces in a clockwise direction on the game board as the received in reputation points.